Home and Garden > Home Office > Digital Coin Counter Bank ? 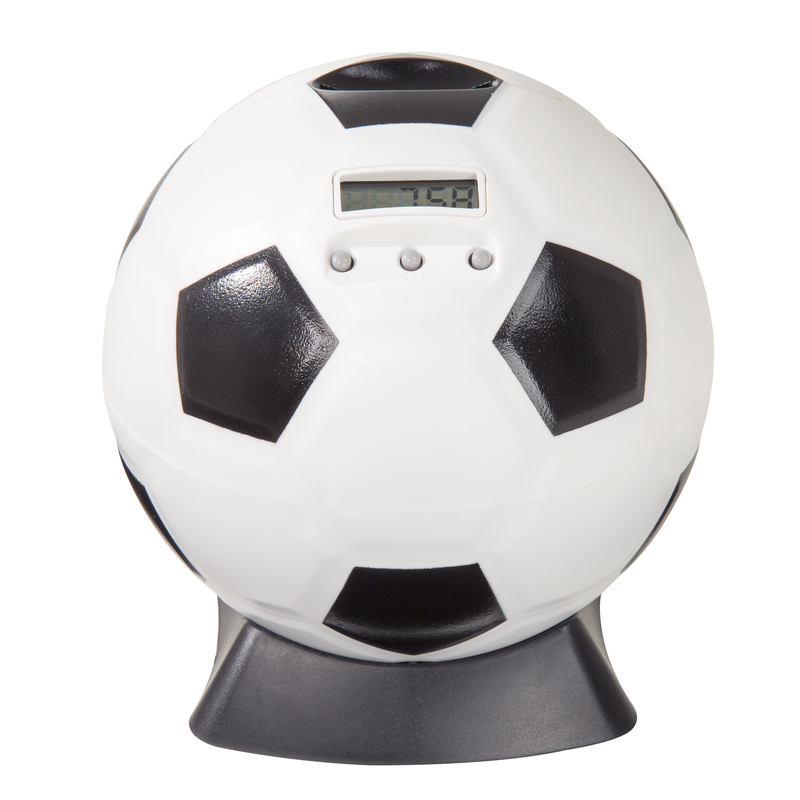 Electronic Soccer Ball Spare Change Jar with Automatic LCD Display to Teach Currency and Saving to Children by Hey! Play! Digital Coin Counter Bank ? Electronic Soccer Ball Spare Change Jar with Automatic LCD Display to Teach Currency and Saving to Children by Hey! Play! 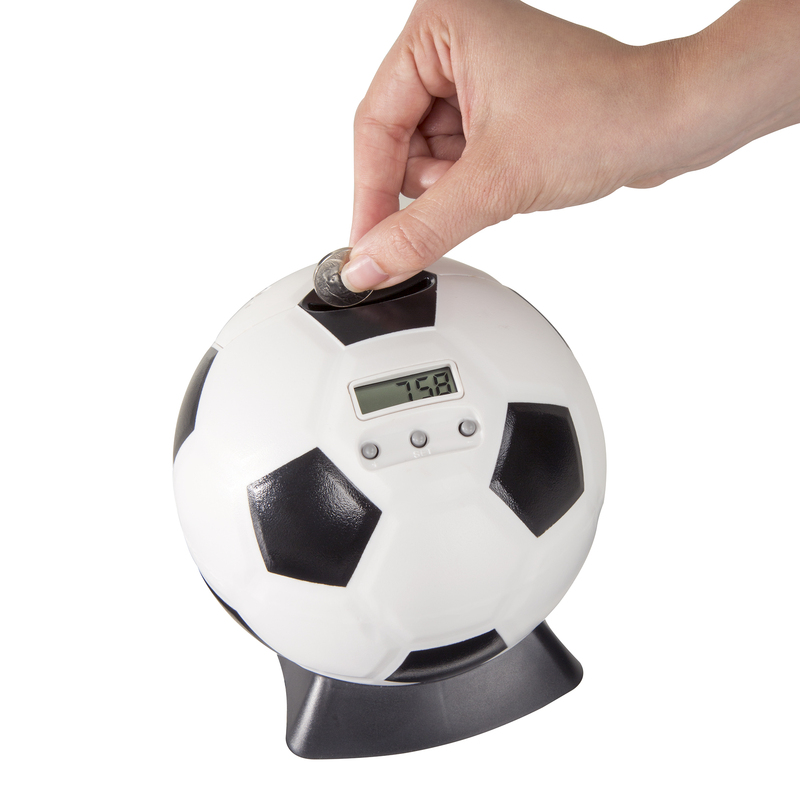 Teach your little ones the value of saving money with the Coin Counting Soccer Ball Bank by Hey! Play! The easy to read, digital LCD display shows the amount of coins deposited as well as the total amount of money in the jar, so your child can watch their savings grow day by day. The screen is powered by 2 AA batteries, so it can be placed anywhere in your home. The fun soccer ball design makes a great addition to your child’s bedroom or playroom as well as providing plenty of space for coins. It’s made of sturdy plastic to make it strong enough to hold a lot of weight and stand up to daily handling. When the bank is full, the base is removeable to allow easy access to coins. Not only does this bank make saving money fun for children, it also helps to teach them how to count and recognize dollar and coin amounts and improve their math skills. This coin counting bank recognizes U.S. currency coins: penny, nickel, dime, and quarter. SHOWS DEPOSIT AND TOTAL AMOUNT- The easy to read LCD screen shows both the amount of coins that have been deposited and the total amount of money in the bank. This helps make saving money fun for little ones as they watch their savings grow day by day. REMOVEABLE BASE- When the soccer ball coin bank is full, the base removes easily. This gives you and your children access to coins so they can be deposited into a bank account or used as pocket money. FUN AND EDUCATIONAL- This bank not only makes saving money fun, it will help to teach them the importance of saving money as well as how to recognize coins and their amounts and improve their math skills as they add up their deposits. 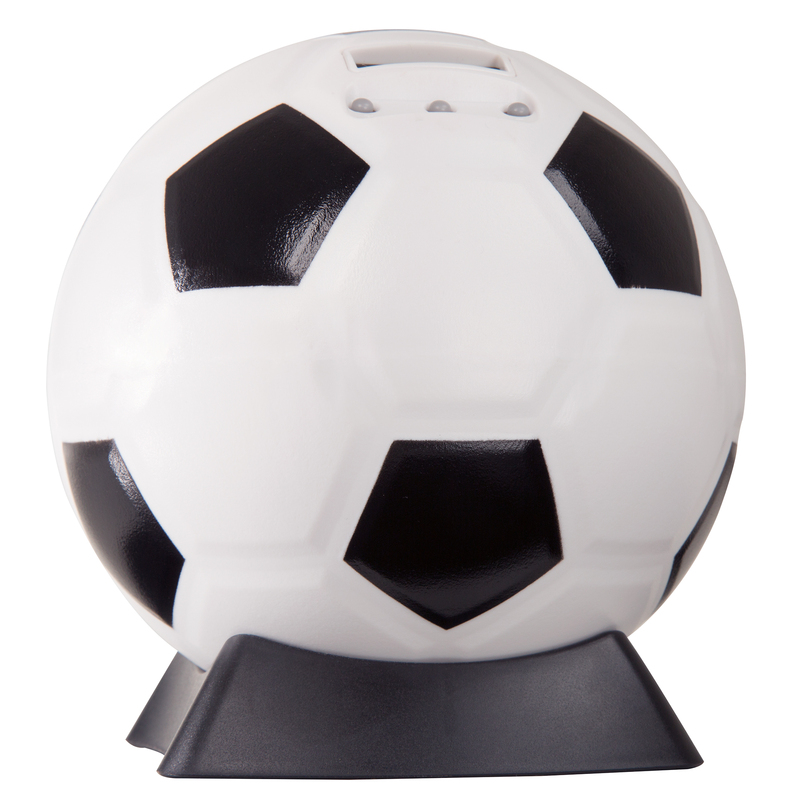 KID-FRIENDLY DESIGN- This coin counting bank comes in a fun soccer ball design. It rests on a pedestal style base, making it a nice display piece to add to your child’s bedroom or play room as well as a safe place to keep spare change. PRODUCT DETAILS- Materials: Plastic. Dimensions: 7” H x 5.75” Diameter. Requires 2 AA Batteries, Not Included. Recognizes U.S. Coins: Penny, Nickel, Dime, and Quarter.